Dense forest at the top of a high bluff was partially cleared to reveal a view of Puget Sound and distant mountains. Although the site was mostly level, a raised septic treatment system needed to be disguised. Spaces for outdoor entertaining, a water feature, vegetable gardening, and watching and feeding the birds were incorporated into the design. 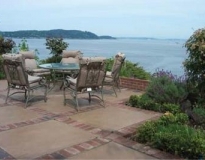 The client's house is on a very steep bluff overlooking Puget Sound with a view of Vashon Island. The previous retaining walls were crumbling and buckling. The grassy area outside downstairs children's playroom extended to top of slope causing concern for safety. The path down to the beach was very steep. The new design created a new play area for the children, a place for vegetable gardening, a place to relax and a place for entertaining near the water. New concrete walls (specially engineered) were installed to stabilize the slope while creating new level areas. New steps and paths were added to connect each of the new levels. The existing slope to the beach was re-graded and widened to allow for kayaks to be brought down the slope. A sloping lawn disappearing into a row of juniper that were undercut by surface runoff created challenging conditions. The client planned to host a wedding in this backyard in late summer, so additional level space for seating also needed to be addressed. 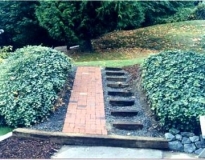 Accessible only through a narrow space between houses or Puget Sound, implementation was a challenge. Broom-finished, tinted concrete bordered by soldier courses of brick provide a large, level area for entertaining. Low growing plant material preserves a view of the Seattle skyline and taller plants screen neighbors to either side. A small cascade and pond provide sounds of water close-by and fish to watch. An outdoor kitchen is conveniently located for outdoor gatherings. Sitting in a field of weedy lawn, the house looked stark, so the clients wanted to reduce the size of the lawn, add some color, prevent vehicles from traveling off the road onto the lawn and add additional parking for guests, adding a larger entertainment area behind the house, adding screening from neighbors. 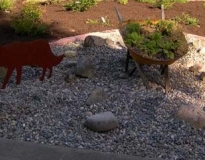 Phase I of a three year implementation plan called for reducing the size of the lawn by adding perennial beds, widening the entry walkway, adding another path from the new parking area. This very steep hill (27 feet of elevation change) was all grass which presented safety concerns for the older couple who maintained the yard. Regularly visiting grandchildren needed a place to play away from the road. Additional safety measures were needed around deck at the back of the house. Two tiers of 4 foot high rock walls were placed to create level areas for planting. 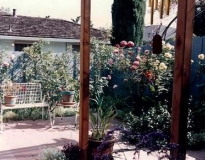 Instead of lawn, the entire hillside was planted with flowering shrubs that would fill in the space within a few years to eliminate weeding (as well as mowing). A new ramp was added to navigate to the backyard. 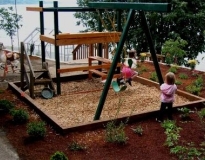 Plantings around the back deck prevented inadverdant steps off the edge as well as defined the play area for children. Originally a field of weeds, the client wanted to use the area for outdoor entertaining, playing net games, strolling to enjoy the garden, and add screening from neighbors. Located next to a green belt, the client also wanted to extend their Asian style interior to their outside space. The forest became the backdrop for walking paths that encircled a large lawn area for volleyball, entertaining and relaxing. 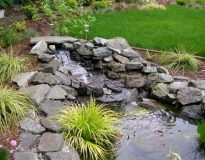 A self-contained water feature gives the illusion of a creek while providing the bubbling sounds of water. 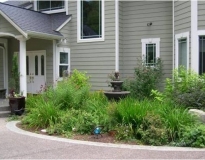 Islands of plants create screening from neighbors while also providing focal points along the path ways. Low bridges are used to cross the creek and disguise the bio-filtration components. This enclosed area behind a middle unit in a townhouse had a small area of bricks improperly set in sand, ivy growing over the fence and no plants at all. The client wanted to use the space for flower and vegetable gardening as well as for entertaining small groups and just being outside after a day's work. A new brick patio that spanned most of the width of the yard provided level space for tables and chairs, and containers for plants. A pergola with shade cloth reduced the reflective heat from the patio outside and inside. 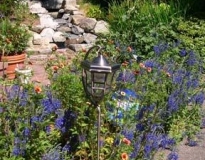 The back third of the yard was planted with flowering fruit trees, roses, iris, and other perennials. The client's home is on a very steep, blackberry infested hill in Bremerton with remnants of an orchard overlooking Port Washington Inlet. The client wanted to transform the landscape into one with year-round color and texture, and create an arboretum that illustrated plant diversity, ecologically appropriate plant groupings, and pathways to explore the garden. 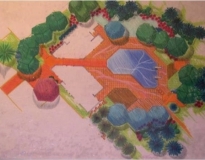 Several designs for different microclimates on the property were implemented over 5 years resulting in a cohesive whole that is now Albers Vista Gardens, a non-profit foundation dedicated to ensuring the continuation and preservation of the collection, provide learning and research opportunities in horticulture and to inspire and educate the public, particularly in regard to creation of sustainable landscapes and the selection and use of horticulturally exceptional plants for the Puget Sound region. Sometimes a client desires a picture of the new landscape prior to implementation, and Garden Vision created the art you see here.